Fantasy football is a game in which players (called �owners�) draft individual players from the National Football League onto their team and score points based on their performance during a given NFL season. Leagues based around college football also exist, but professional football fantasy leagues are easily the most popular. Pro football lends itself to fantasy football, though, because of the uniformity of schedule and the more balanced competition. The story of fantasy football goes back longer than you might think, all the way back to the Sixties. The original idea for fantasy football is credited to Bill Winkenbach, who once served as a limited partner with the Oakland Raiders. In 1962, he and a group of men associated with the Raiders organization (including member of the media) embarked on a three-week road trip to the East Coast. To pass the time, the men expanded on Winkenbach�s original idea and later formed the Greater Oakland Professional Pigskin Prognosticators League, which is now known as the world�s first fantasy football league. The game slowly grew in popularity for decades, and numerous magazines were devoted to the subject by the early 90s. With the rise of the Internet near the turn of the century, fantasy football reached all-new heights. Today, the game is bigger than ever, with some national contests paying out hundreds of thousands of dollars to fantasy football champions. Most fantasy leagues are made up of anywhere from 8 to 16 teams. Each team has a roster of players, usually in the range of 15 to 20. Traditionally, a fantasy player can only be on one owner�s roster at any given time. Redraft – Owners draft a fantasy team from scratch, and players do not carry over from one year to the next. Keeper – Owners can keep a limited number of players on their roster from the previous seasons. The rest of their team is drafted like in a redraft league. Dynasty – Owners may keep as many players from previous years as they wish. They may then fill any remaining spots through the draft. Once teams have been built, owners must then choose which players to field on a week-by-week basis. While star fantasy players may be started every week, other players may vary in regard to favorable or unfavorable match-ups. In addition, injuries play a large part in the game, and owners must be careful to select starters who will take the field on a given week. In many leagues, owners will start a quarterback, two running backs, three wide receivers, one tight end, one kicker and one team defense, but the weekly line-up can vary greatly from league to league. Some use a �flex� position, which allows owners to start a basic lineup and then add either a running back, receiver or tight end into the mix. In other leagues, players may have to draft (and start) individual defensive players instead of an entire team�s defense. In rare cases, a team might even be required to select two starting quarterbacks each week. Once all the owners have set their lineups for the week, points per player are determined by their real-life counterparts on the football field. As with starting lineups, scoring systems will vary from league to league, but the following is a fairly standard representation. In some leagues, negative points are awarded for interceptions, fumbles and the like. Defensive points can vary wildly (especially if individual defensive players are allowed), and it�s always a good idea to be familiar with your league�s scoring system before drafting a team. Head-to-head – In this system, each team in the league is pitted against another team in a weekly match-up. The team with the highest-scoring lineup for the week is given the win, while the other team incurs a loss. At the end of the regular season (usually Week 13 or 14), the teams with the best records advance to the playoffs. This generally culminates in a �Fantasy Bowl� to determine the league�s champion. In most cases, league championships take place during Week 16 of the NFL season. This is because NFL teams often rest star players during Week 17, and this would cause many owners to suffer an unfair disadvantage. Total Points – Points are tabulated throughout the year, and the owner with the highest overall score at the end of the season is declared the winner. In this system, there usually isn�t a playoff bracket. 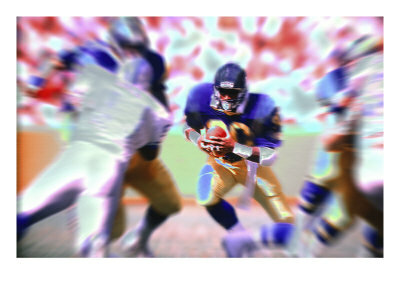 While many fantasy football rules can be more complex, this should give you a basic idea of what�s involved. If you�ve got a group of friends who love the NFL, I would highly recommend it as a great way to supplement your viewing experience. You�ll quickly find yourself taking an interest in teams that you hardly knew existed. And if you can�t get a group of friends to participate, you can always join an online league. With the ever-growing popularity of fantasy sports, there are numerous sites on the Internet which host leagues, put prospective owners in contact with one another and even offer fantasy football advise. Fantasy football allows a guy to feel like an NFL general manager. If you’re an NFL fan and you’ve always thought you could run a team better than your local team owner or GM, give fantasy football a try and see how hard it can be predicting what’s going to happen. Fantasy football is a game, and it’s a pretty darned unique game. Here are several reasons why fantasy football is so much fun. Let’s face it. Most of us play fantasy football to win. Sure, it’s fun to play, but it’s more fun to beat everyone else and show them you know better. When you win at fantasy football–no matter how much luck is involved–and you feel like a genius. Fantasy football is about spending time with friends and having something to brag about. Every year, a bunch of friends come together and draft teams. For the rest of the season, those friends match wits against one another, competing for pot of money, a trophy or just bragging rights. Fantasy football allows people to compete in a game once we get a little too old to go out and play tackle football on a lot somewhere. League owners can gather to watch games and talk trash about who’s winning. Some football purists argue against fantasy football, saying it ruins the fun of the game to pull for a player on one team while hoping the other team wins. I’ve found that fantasy football simply enhances the fun of the game. I can still watch my favorite team play and cheer them on a playoff run. But when the only game on t.v. is Detroit Lions vs. the Arizona Cardinals, I still have a reason to watch. Sure, the purist might enjoy watching two 4-12 teams play, but most of the rest of us want something on the line. So if Roy Williams or Anquan Boldin play for you or your opponent, you’re still on the edge of your seat. Diehard NFL fans keep track of the offseason moves anyway. But when you’re in a fantasy football league, there are even more reasons to keep an eye on the third receiver who moved from the Chiefs to the Saints to be the starter. If you’re in a keeper league, offseason player moves take on a whole new dimension. These moves affect your team before the draft even comes. For instance, I grabbed Michael Bush as a keeper RB for the Oakland Raiders late in the draft last year, figuring I could sit on the injured runner for a year and I might have a starting NFL running back stashed on my bench. So when the Raiders drafted Darren McFadden, I had a special reason to cuss Al Davis. There’s another thing to consider. Fantasy football is a way for friends to stay in touch. I have a few fantasy football buddies I’ve known for twenty years that I only see once a year these days, during the NFL draft. For the next few months, we stay in touch on the fantasy league’s message board. We make crazy trade proposals and generally talk about the NFL and our own league. In the case of a few of these guys, we probably would lose track of one another. With families and work and everything, it’s hard to stay in touch. But for one day a year, we have a reason to leave the wife and kids behind and get together for some good old-fashioned sports fun.